Dog treats are an important purchase for any owner. They can be a nice way to reward your pup, but they can also be a hazard or lead to poor health when the wrong option is chosen. Top dog treats available today contain healthy and natural ingredients and avoid grains, unhealthy fillers and other ingredients that don’t benefit dogs. Many mainstream dog treats sold today are manufactured overseas and make use of questionable ingredients or processing practices. We’ve taken the time to locate the best companies that source their ingredients and handle all the manufacturing tasks right here in the USA. Below are our picks for the best dog treats made in the USA. With thousands of different dog treat manufacturers around the world, it’s tough locating a good source for your pet’s treats. We located the top dog treat suppliers from the United States and put together a list of the seven best treat options based on type. You can choose the type of treat that your pup loves, and feel confident in the option that you went with. These treats aren’t the cheapest on the market, but they are some of the highest quality and most delicious available in the USA today. Learn more about each of our top treat selections. Find out where they are from, and the features that we liked and disliked about each of the items on this list. 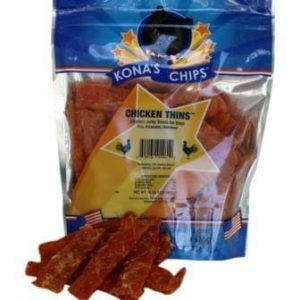 Made in Oakdale, California from 100% USDA chicken without any fillers, Kona’s Chips Chicken Thins are a product that you can feel good about giving to your dog. The company was started when the founder’s dog got sick from treats made in China in 2007. From then on, Tom Darmstandler has been on a mission to make dog treats with the highest quality ingredients. “There just seems to be a better sense of quality in what we produce in here the USA than from foreign sources. That way we knew what went into our products and could control the quality,” says Tom, who we spoke to over email. This jerky treat is full of high quality protein that will make your little furry friend feel great. It’s also thin, breakable and moist, making it easy for dogs to consume. We found these treats very easy to work with, and simple to feed to dogs of all different sizes during testing. Even older dogs can enjoy the treat comfortably thanks to its careful design. These chips are sold in three different sized bags, and samples are available to see if your pup enjoys eating them. Rocco and Roxie is a family-owned business that’s dedicated to delivering high quality pet treats that are safe and healthy for consumption. 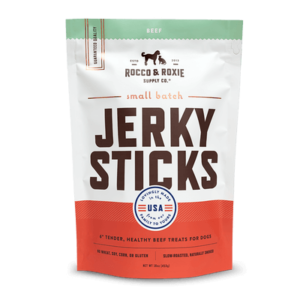 These gourmet Beef Jerky Sticks offer a high quality taste and texture that pets love, while utilizing safe and healthy ingredients. We were thrilled when looking at the ingredients list for this product. The first ingredient in this product is American beef, and no fillers, grains or glutens are used as an ingredient in these snack sticks. They come in a small and convenient form-factor and make excellent treats for both small and large dogs. Each 15oz pack of jerky sticks is resealable to keep the product fresh, and all orders of $50 or greater ship right to your home for free. Pet Parents is an American company with a focus on producing top-quality and sustainable products that have been approved by fellow pet parents, and Gnawtlers Elk Antlers are no exception to this formula. 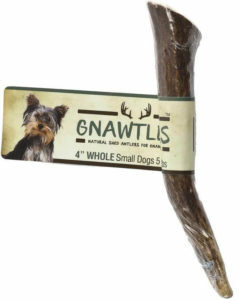 Gnawtlers Elk Antlers are top quality dog treats that are carefully selected for a healthy and safe product. The antlers that are shipped have been looked over carefully and sanded down to make them safe for consumption. The antlers come in four different sizes to suit dogs of all different sizes, and they are packaged in vacuum-sealed bags to keep them fresh until use. We love that each of the antlers sold by Pet Parents was naturally shed and sustainable compared to antlers removed manually. These antlers contain healthy marrow that serves as a rich source of manganese, calcium, zinc and phosphorus to improve your furry friend’s diet while keeping them busy. Each rawhide chew produced by Wholesome Hide is made from healthy beef cows raised right in Chicago. “We are able to get the best beef hides in the U.S. and can oversee every step of the processing,” says Wholesome Hide, who we reached out to over email to get their take on why they choose to make their treats in the USA. These chews come in many different sizes, from small chips and donuts, to full sized knots and twists. They are made from full sheets of hide, making them more durable and less prone to breaking during chewing. These hides are processed naturally without the use of any chemical whiteners or solvents, helping them have a more natural appearance and keeping them healthier for your dog. The gentle treatment processed used by Wholesome Hide also ensures that the collagen layer of these rawhide treats remains intact, giving the treats more flavor for your little one. 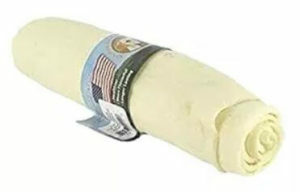 These products are 100% made in the USA and use ingredients sourced from within the country – we included links below to both the roll version (pictured) and chips. 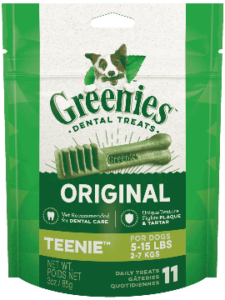 Greenies Dental Chews are a well-known product designed to improve the oral health of your dog. These chews are offered in a range of sizes, making them effective for small and large dogs. The chews are flexible, tasty and offer enough depth to properly clean your dog’s teeth. These treats work so well because dogs can sink their teeth in up to the gum line, pushing away unhealthy tartar and plaque and leaving the tooth’s surface nice and clean. We really enjoy how neat and clean these treats are. They help improve dental health without making a mess like some other options. Cloud Star offers a wide collection of healthy, made in the USA pet treats, and the Peanut Butter Buddy Biscuits are one of their best products. 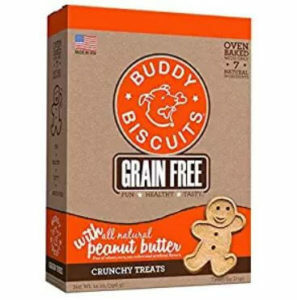 These biscuits are designed to have the rich flavor of natural peanut butter that most dogs love, while eliminating the unhealthy ingredients that some biscuit treats contain. They are free from grains, wheat, eggs, soy and corn. 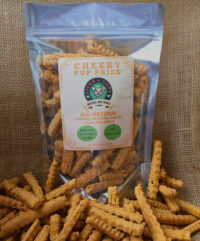 Each treat uses a very natural mix of ingredients with chickpea flour, potato flour, cheddar cheese and maple syrup serving as the main ingredients. The biscuits are shipped in several different sized boxes or bags, and come in a size that’s good for medium to large dogs intact, and good for smaller dogs when broken apart. We really enjoyed how easy these biscuits are to break apart cleanly, making it easy to size them for any dog that you have. Licks n’ Love is a company based in the U.S. that offers all-natural dog treats designed to provide a good mix of delicious flavors and healthy ingredients. The Licks n’ Love Pup Fries are made from all-natural ingredients and designed to offer a flavor that your dog will love. They are sold in flavors like pumpkin apple, peanut butter and cheesy. We love the fry-shape of these treats and how easy they are to hand to our pups during testing without the need for breaking apart. These fries are small enough for breeds like chihuahuas to enjoy, while still being substantial enough for large-breed dogs. Dogs respond really well to the flavor of these treats, and without all the preservatives these are easier on the digestive system. Each of these treats is gluten, wheat and soy free and a good healthy treat alternative. Dog treats should be a healthy snack and a way to praise your pet. Our carefully selected treats are well-known for their natural ingredients, and many offer a nice boost of nutrients and vitamins that can only be good for your pup. This is also an important consideration factor we had when choosing the best dog food made in the USA. Dog treats need to be safe to consume first and foremost. Not only should they be free from harmful chemicals and preservatives, but they also need to break apart safely and avoid properties that could make them serious choking hazards. When evaluating treats we look closely for artificial preservatives like BHA, BHT, potassium sorbate and ethoxyquin and try to avoid those. We also look out for chemical-based humectants like glycerin, and propylene glycol, as well as artificial colors that don’t make the treats any more appealing to your pet at all. Even with a careful attention to detail it’s still important to monitor your pet when trying out any new treats to make sure they are safe though. Flavor is an important element of any dog treat, and these all-natural treats are some of the most flavorful on the market! Our treat selections are more likely to be favored by dogs than their lower-quality counterparts. The best treats that excellent flavor characteristics are flavored with meats, or natural sweeteners and ingredients such as peanut butter or molasses. With a bit of trial and error you should be able to find several quality treats that your dog will love. Different dogs do best with different sized treats, especially when it comes to a hard chew like antlers or rawhide. That’s why all of our top recommendations are available in different form-factors when it matters. Whether you have a small or a full-sized breed of dog, you can purchase our recommended treats confidently knowing that your pup can safely enjoy them. Customers that want to save as much as possible like to take advantage of bulk offerings whenever possible. We look for treat options that come in bulk sizes when we can and love options that are offered in large quantities for owners with multiple dogs. We want you to feel like you’re getting high quality and healthy treats that you can feel proud to feed your pup, without spending a fortune doing so. That’s why each of our recommended products is a high value item that you can feel good about purchasing. Many of these treats are known for lasting longer and providing more nutrients than the cheaper alternatives.